Ever since the Maori christened New Zealand ‘The Land of the Long White Cloud’, weather has featured in the minds of local people. Sat in the middle of the Roaring Forties (a region with strong westerly winds), New Zealand enjoys an ocean temperate climate, making it pleasant most of the year round with occasional periods of cool, rain and wind. There is, however, a wide range of conditions from north to south, with subtropical weather in the north and more temperate conditions in the south. Generally, the north has no extremes of heat or cold; winter can be quite cool in the south, with snow in the mountains. The eastern areas often experience drought conditions in summer; the west, particularly in the South Island, has more rain. New Zealand’s seasons are directly opposite to those of the northern hemisphere although it’s often possible to have all four represented in one day. Spring (September/October) is beautiful as new blooms emerge, yet the peaks stay snow-capped; summer (November to March) enjoys the best overall weather; autumn (March/April) is a time of spectacular colours, especially on the South Island; winters (April/May to August September) tend to be wet and cool. There's great winter skiing in the centre of the North Island and in the South Island's Southern Alps, where heli-skiing is particularly popular. The best time to visit, taking into account the climate, crowds and other conditions, is October/November or March/April. Lightweight cottons and linens are worn in the North Island most of the year and in summer in the South Island. Medium weights are worn during winter in South Island. Rainwear is advisable throughout the year, and essential if visiting South Island's rainforest areas. A hat and sunblock are essential during the summer thanks to the ozone depletion above New Zealand. New Zealand encompasses two major islands stretching north and south that are separated by the Cook Strait; a third, less substantial island, Stewart Island, is located 30 km (19 miles) off the tip of the South Island across Foveaux Strait. The three main islands are fringed with numerous smaller islands. The more developed North Island (116,031 sq km/44,800 sq miles) is home to the main cities, including the country's largest city Auckland. The island’s rolling green hills are dotted with sheep and horses, and the central heartland pulses with geothermal activity; boiling mud pools, geysers and active volcanoes. 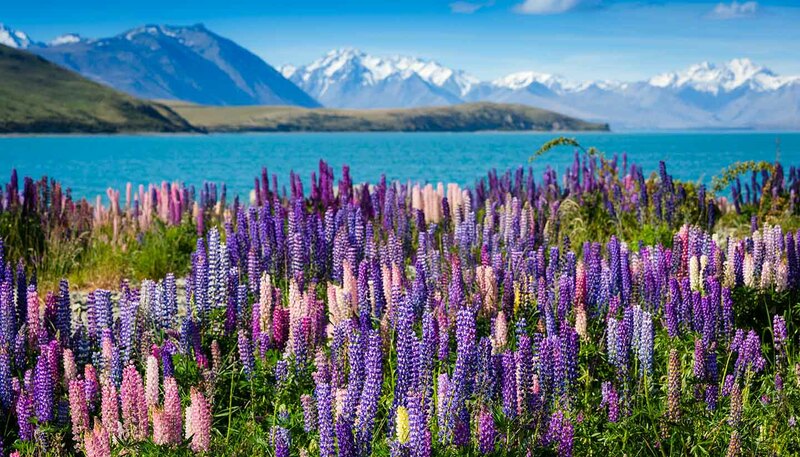 The dramatic South Island (153,540 sq km/59,283 sq miles), is a stunning microcosm of snow-covered alps, fjords, glaciers and charming British-style towns such as Christchurch and Dunedin. Stewart Island (1,746 sq km/674 sq miles) is largely undeveloped and an excellent indication of what much of the country must have once looked like. Its permanent population is slightly over 400, most of whom live in the only major settlement, Oban. There are four associated territories: the Cook Islands, which lie 3,500km (2,175 miles) northeast of New Zealand; Niue, 920km (570 miles) west of the Cook Islands; Tokelau, three atolls about 960km (600 miles) northwest of Niue; and the Ross Dependency, which consists of over 700,000 sq km (270,270 sq miles) of the Antarctic. Note: The Cook Islands and Niue have separate individual sections in the World Travel Guide.